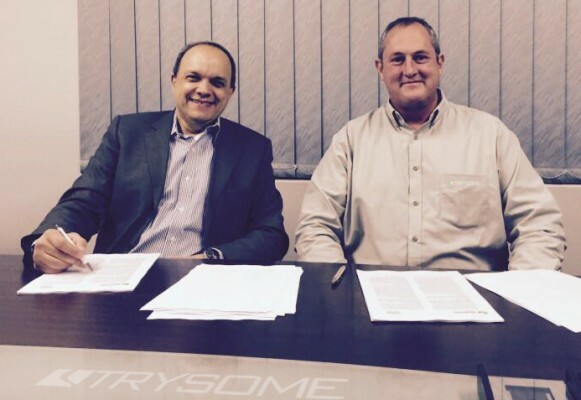 Trysome Auto Electrical (Pty) Ltd South Africa today announces the renewal of its re- seller agreement with Hexagon Mining. 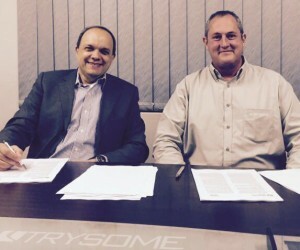 CEO, Eddie Smith and Hexagon Mining President, Hélio Samora strengthened the long-standing collaboration between the organizations by sign- ing a new agreement at Trysome’s head of ce in Johannesburg, South Africa, April 21. The partnership ensures the continued avail- ability of Hexagon Mining’s SAFEmine suite of collision avoidance solutions in the South African market. It also means strengthened service and support for Hexagon Mining’s wider portfolio of integrated solutions. Besides collision avoidance and fatigue monitoring, these solutions include proven technologies for surveying, design, eet management, and production optimization. Trysome has represented Hexagon Mining in the sub-Saharan African region since 2008. Today, the agship Collision Avoidance System (CAS) is running in more than 25,000 mining vehicles in more than 60 mines worldwide. Samora and Smith agreed that renewed collaboration is good news for customers in South Africa. Under new laws, mines will soon be compelled to enhance safety for all Trackless Mobile Machinery, such as haul trucks. Smith called the companies’ relationship an “ideal partnership”. “Hexagon’s international experience and Trysome’s 26 years of African market expertise, infrastructure, and footprint are ideally suited for customers facing second-phase legislation,” said Smith. “With over 150 skilled technicians and a team of specialist engineers, Trysome is well geared to meet local demand. VIS will be launched in June at HxGN LIVE, Hexagon’s user conference in Las Vegas, June 13-16.